China's western Xinjiang region has written "vocational training centres" for Muslim Uighurs into law amid growing international concern over large-scale disappearances there. 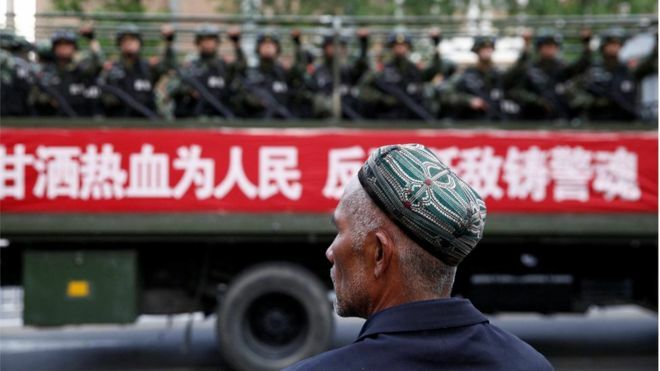 Xinjiang says the centres will tackle extremism through "thought transformation". Rights groups say detainees are made to swear loyalty to President Xi Jinping and criticise or renounce their faith. In August, China denied allegations that it had locked up a million people. But officials attending a UN human rights meeting admitted that Uighurs "deceived by religious extremism" were undergoing re-education and resettlement. Xinjiang has seen cycles of violence and crackdowns for years. China accuses Islamist militants and separatists of orchestrating the trouble.